As our nation’s military fighting men and women finish their tours overseas or approach retirement from a career defending our country, many are now turning to entrepreneurship as a way to bridge the gap to full-fledged retirement. 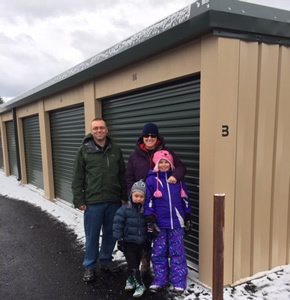 Kristine and Chad Jenkins, owners of Georgia Self Storage LLC in Georgia, Vermont are a fine example. Chad recently began approaching his retirement from the military after many years in uniform, and knew he was ready for a new challenge. The recently opened rental storage facility located not far from Interstate 89 Exit 18 at 198 Morse Drive was the answer. “We are veteran-owned, and family-run,” Chad said. We provide safe and secure storage options. We have 24-hour gated access and many different sized units,” he said. But before he could get the storage facility up and running, Chad knew he needed some assistance and began researching online for what resources are available to Vermont entrepreneurs. He soon came across Vermont Small Business Development Center (VtSBDC) Area Advisor Steve Densham. Densham, Chad and Kristine quickly went to work turning the family’s dream into reality. Chad said their work together helped him be more assertive and clear about what he wanted for his business, and that patience and optimism are vital qualities to have when starting a business, he said. For more information on Georgia Self Storage LLC, visit www.selfstoragevt.com, and for more about VtSBDC and the services provided by area advisors check out www.vtsbdc.org.